Whether you're chasing the kids, navigating the car line or walking dog, these cozy knit slippers make everyday actions feel a little more pleasant. 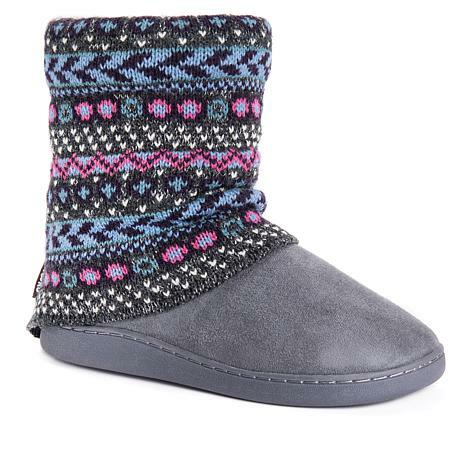 I got these slipper boots in grey and they are so cute. They are warm for inside but I would not want to wear them outside. The quality is excellent and they are very well made. I got them at a sale price or on To days Special. They are great for inside wear but I would not recommend them for outside. I bought this pair as a pair to be able to go outside and quick trips to the store or on those days in the office I can slip off the winter boots and slip into these. These are a medium, and I have a true 8.5 wide foot. They are snuggly warm but not too tight I am right at the end of the toes though. 4 Stars due to I wish the sizing on the video was a little better. I had to order twice for me. Boot slips on nicely and fits well. I am size 6-1/2 to 7 wide so I selected the medium size. My foot has plenty of room. The only thing I don't like is that the top of the boot seems a little flimsy. But I have to remember it is a Slipper, and not a real boot. I bought 2 different colors. The cuffs are very pretty & colorful. Not as comfortable foot bed as I thought, but warm. I had to return because the back of the cuff wasn't sewn in correctly and it created a lump which could be felt while wearing. They really can be used as a boot for every day wear in dry weather.